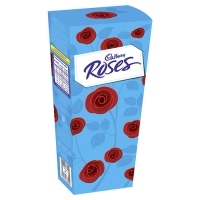 Roses are an inexpensive confectionery, containing a small proportion of cocoa solids, and a high proportion of vegetable fat. A large packet can be bought cheaply, making them a common stand-by gift choice due to the variety of contained chocolates. They are an extremely common gift on Mother’s Day and sell well throughout the Christmas period.